This afternoon General Pettygree and I set up the terrain for our Leuthen game tomorrow. I had brought some of the troops and terrain to his house on wednesday, but half way there I realized that I had not packed the winter game mats into my vehicle. DOH!!!! That's OK, I guess, because my SUV didn't have enough room to carry both my Austrian and Prussian armies plus all of the winter terrain; so I would have had to make a second trip regardleess. I took some pictures of the terrain in its pre-battle state and I don't mind saying that I think the Winter terrain in my collection looks pretty good. Leuthen village view from the west. Leuthen church as seen from the east. A view of the inside of the town, with Austrians starting to deploy inside some of the buildings. 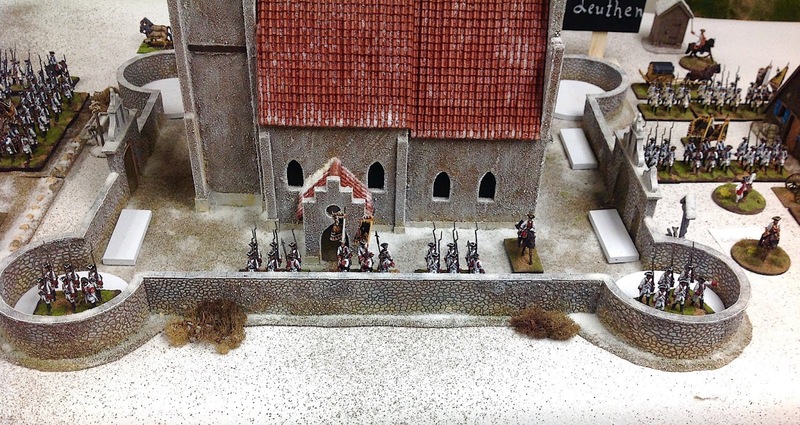 of the Prussian Guard gained entry into the churchyard. The Rot Wurzburg regiment is deployed inside the walls of the churchyard. 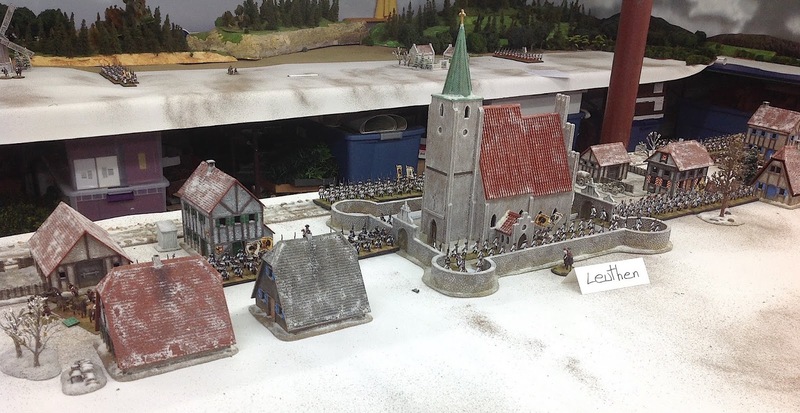 The Prussian Guards Brigade form up in front of Leuthen church. 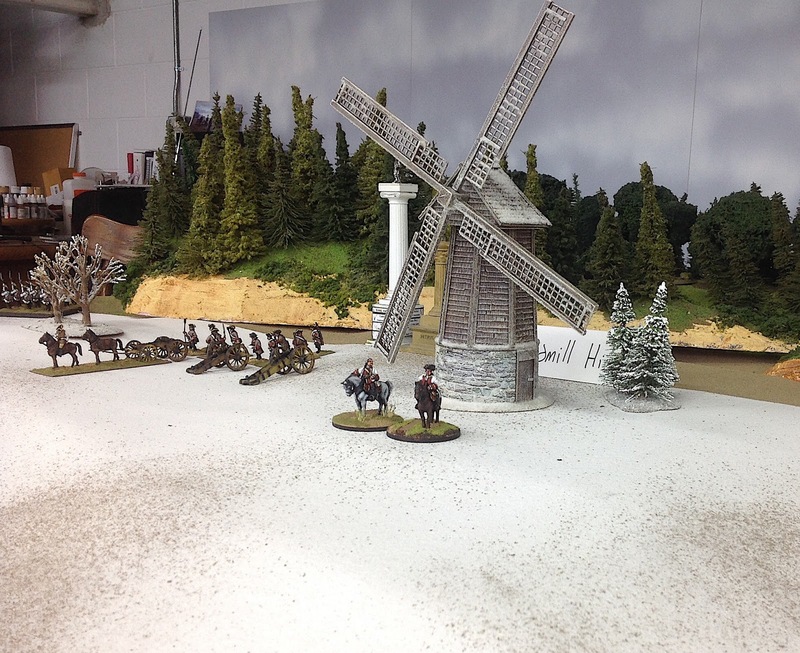 As Phil Olley would say, "every wargame table needs to have a windmill". I quite agree with that statement, so here is a picture of my Winter windmill at Leuthen. what the heck happened and where did all of the Prussians come from. The game kicks off at 9:30AM tomorrow morning on Saturday December 1, 2018. I will probably post game action pictures on Sunday. I hope that you enjoyed the preview of our game. which is defended by the Rot Wurzburg regiment. 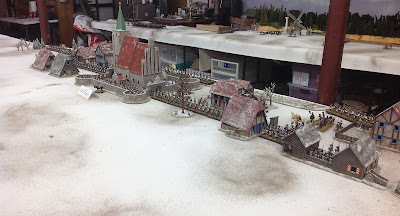 I am travelling north to General Pettygree's game emporium to play our annual Christmas and Birthday Wargame. We do this every December as a Christmas party plus several of our group (me) have December birthdays. Itzenplitz regiment (IR13) will be travelling to Brown Deer, Wisconsin today. I am dropping off my Leuthen winter terrain at the General's house today so that we can set up the terrain and position the troops prior to the start of the battle at 9:30AM on Saturday December 1, 2018. 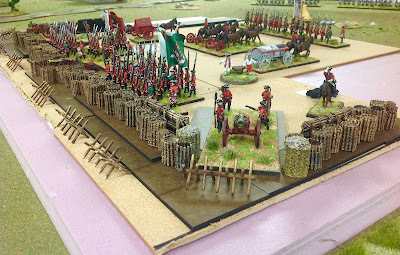 The pictures posted on this thread are from my solo Leuthen game staged last December 2017. New pix of the terrain setup will be posted this evening and of course game pix will be posted over the weekend. The Austrian army will be waiting for them. 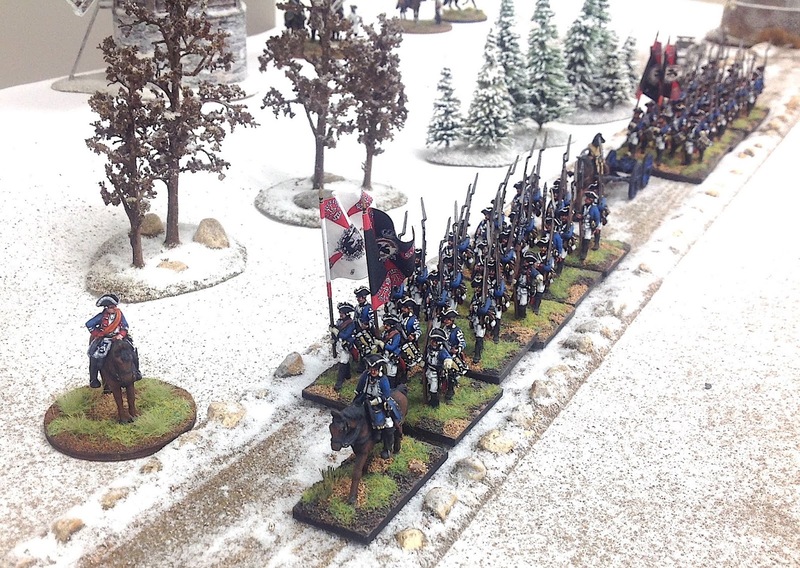 The Rot Wurzburg regiment defends the Leuthen churchyard. 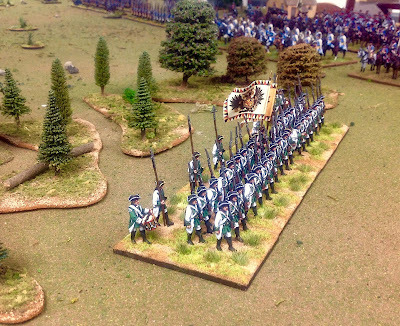 I am working on a game scenario for the Battle of Kunersdorf - August 1759 - that I may run at the 2019 Seven Years War Association convention. 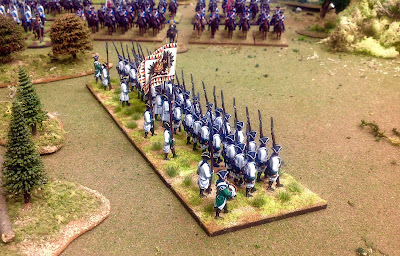 The battle features Frederick the Great's Prussian army versus a combined Austrian and Russian army. One of the features of the battle is the extensive defensive earthworks that the Russians built. The Prussians had the unenviable task of assaulting these works. The left corner of the redoubt covered by a Shuvulov Howitzer. The Battle of Kunersdorf starts with the Prussian advance guard attacking the Russian Observation Corps, which was hunkered down on the Muhlberg behind some field works similar to the ones shown in the various pictures on this blog thread. To make a long story short, I need gabions. Lots of gabions. And other field works bits and pieces such as cheveau de frises and fascines bundles. After doing a lot of searching for suppliers of resin and metal gabions, I settled on items from Warfare Miniatures extensive selection of field works components and the large metal gabions that RSM95 makes. The picture below shows how all of the siege equipment pieces can come together in sections of earthworks, using the Warfare Miniatures accessories. 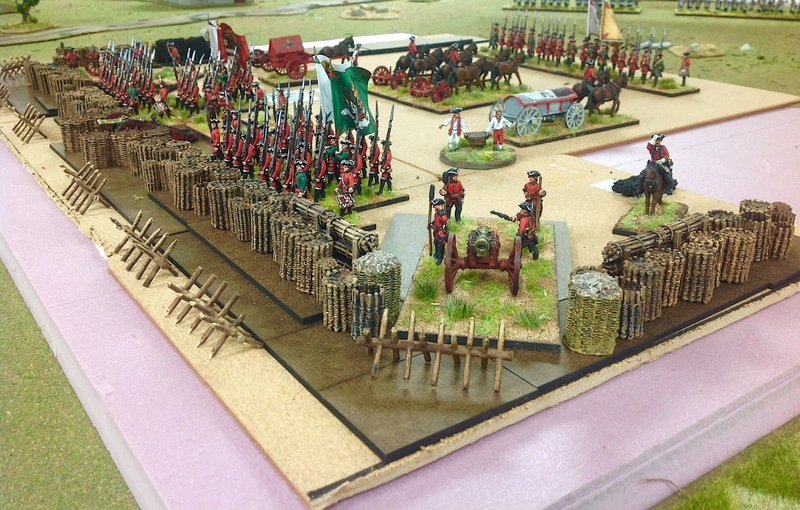 Barry Hilton has done an impressive job on this diorama. Barry uses cork backed dinner table place mats for the bases of his earthworks. I went to my local Target Stores location and found some cork table mats in the kitchenwares section of the store. The mats measure 16-inches by 8-inches and I cut mine in half, scoring the cork backside with a heavy duty box cutter. Once I have come up with combinations of gabions and fascines to use on my mats, I will spray paint them a dark brown color, then glue the painted pieces onto the base, add my mix of spackle compound + brown paint goop, and spread it across the mat. While the spackle goop is still wet i will sprinkle fine railroad ballast over the surface and wait for it to dry. Finally, when the spackle dries, I will do a little bit of dry brushing with a lighter color (tan? ), followed by some tufts and grass to finish the mat. 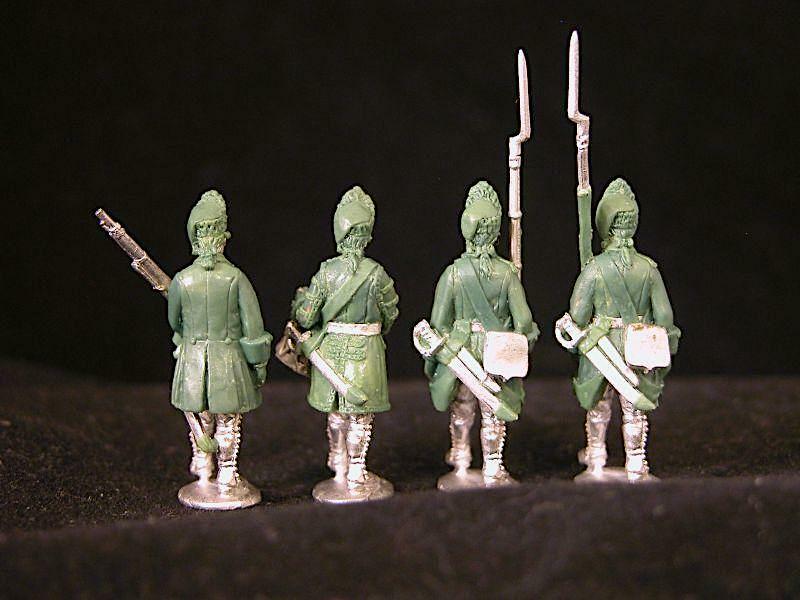 Barry Hilton's defensive works with pieces from his Warfare Miniatures range of figures. Field works "work in progress" by Barry Hilton. Click the picture to enlarge and get a better view of the gabions and fascines. Here is a picture of a potential gabion redoubt that I will use in my Kunersdorf game. I still have a lot more pieces on order from Warfare Miniatures so I don't want to finalize my configuration until I have painted the reinforcments. The right corner work in progress. The gabions, fascines and cheveau de frise pieces are easy to paint. I prime them with black primer and then dry brush a dark brown across the surface of the piece. I continue to dry brush consecutive layers of ever lighter colors until I get the look that I want. I finished off 50 gabions and 20 cheveau de frise over a weekend, so the work goes relatively fast. 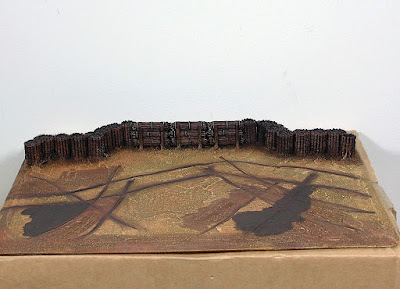 RSM95 minatures has some nice large gabions that I will place around the gun battery positions. RSM does not have an on-line ordering system on their web site and so getting your order involves getting ahold of proprietor Richard Masse via email and then working out a way of charging your credit card. I'd suggest mailing your credit card info in an envolope or call Richard, but do not email your credit card information as your data is not secure using convention email. Most of you already know that, but I thought that I would mention it anyway. 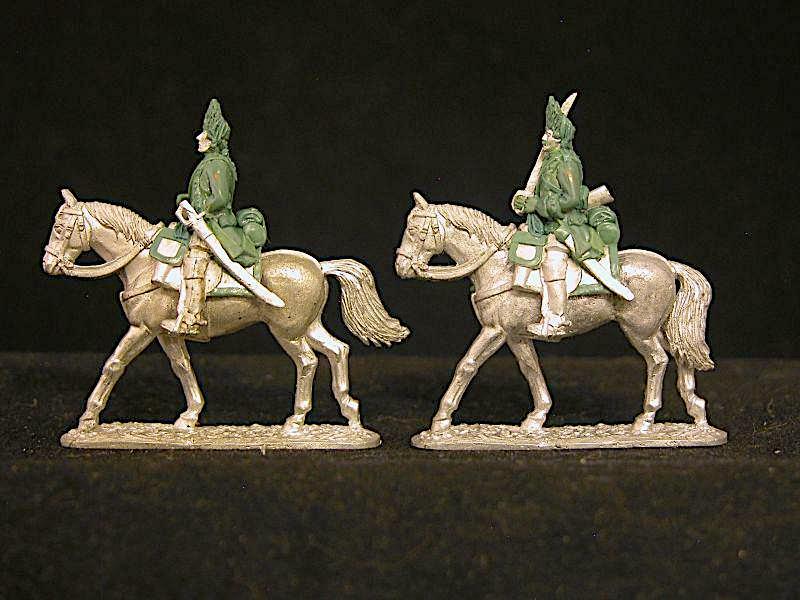 So here are the pictures for Part II of the announcement of the new additions to the Minden Miniatures Seven Years War figure range. The greens have been sent on to Griffin Moulds so that the master moulds and production moulds can be made. After that, we start spinning metal and getting the castings into production and ready for sale. I am going to estimate that I will have the new figures in stock in about four weeks. 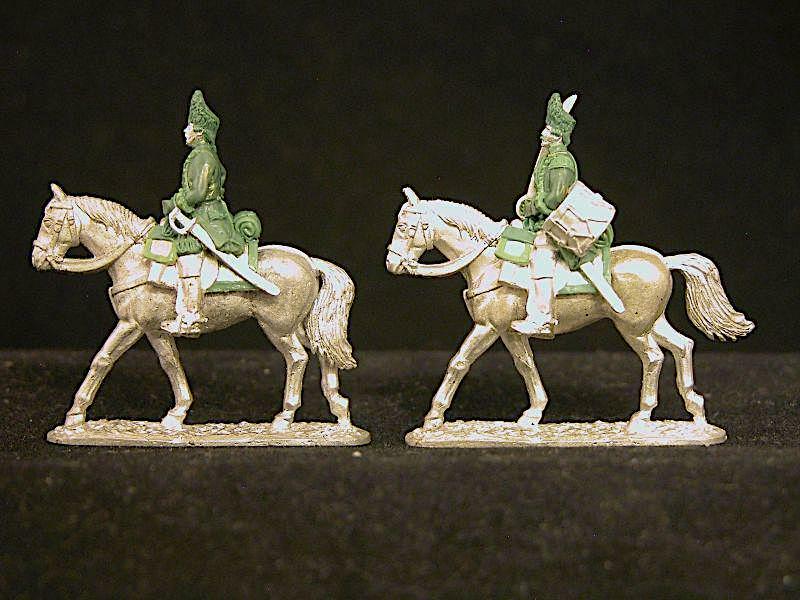 Reverse view of the Austrian Horse Grenadier officer (left) and drummer (right). 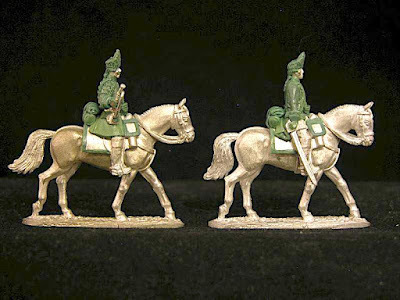 Austrian Horse Grenadiers: Standard Bearer (left) and Reiter (right). Each Austrian Dragoon regiment had five squadrons of dragoons and one elite squadron of horse grenadiers. Typically, the horse grenadier squadrons from several dragoon regiments would be converged into one or more elite cavalry units prior to the start of the battle. After the battle, the horse grenadiers would return to their respective regiments. I am really excited to see the Austrian Horse Grenadiers added to the Minden range. This fills an obvious hole that was in the Austrian cavalry lineup and I know that I will be busy painting them once the new year rolls around. I paint a regiment of Austrian dragoons and then add on a squadron of the horse grenadiers. 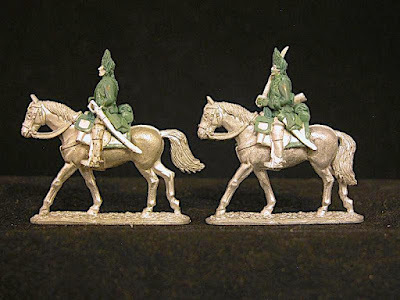 Once I have painted several dragoon regiments, then I can hive off the grenadiers from the parent regiment and create a horse grenadier regiment comprised of the grenadiers from dragoon regiments in my own army. French Cavalrie in bearskins: Trumpeter (left) and Officer (right). Reverse view of the previous picture above. 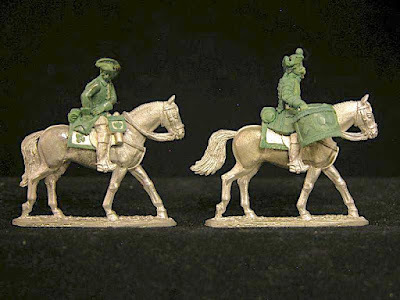 French Cavalrie in bearskins: Standard Bearer (left) and trooper (right). All of the "foreign" cavalry regiments in French service during the WAS and SYW wore bearskin hats. So the Fitzjames (Scottish) and the German regiments wore bearskin hats throughout the war. Of course, the French Cuirassiers du Roi also wore bearskins, but that regiment already has figures available in the Minden range of figures. 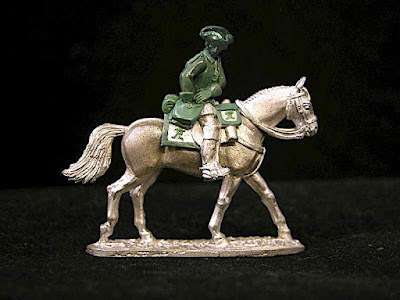 Prussian Jager zu Pferde delivering message. A private commission from a Minden customer. 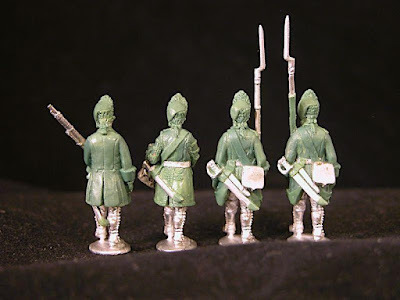 Last week I received a batch of 16 new Minden figures from sculptor Richard Ansell and I think that you will enjoy the goodies that are headed towards the production pipeline. The new additions to the Minden Miniatures figure range includes French Cavalrie in bearskin hats, French foot grenadiers in bearskin hats, a French kettle drummer, Austrian horse grenadiers and finally, two French personality figures: Marshal de Broglie and Lt. General Chevert. It's a tough day if you are a bear, but a very exciting day here at Minden/Fife & Drum headquarters. The new greens fill in some major holes in the SYW French range of figures and include some personality figures to command your French armies. I think that Broglie was one of the best French marshals during the SYW and showed competance and professionalism in all of his campaigns. The Battle of Bergen was probably his signature victory over Ferdinand of Brunswick. I also like Chevert as he seemed to display "outside the box thinking", notably at Hastenbeck where his attack on the flank and rear of the Hanoverian army led to a French victory. An earlier version of the Jager, before a mail pouch was added to his right side. The other side of the French kettle drummer is on the right. French grenadiers wearing bearskin hats. Bearskins were worn by the Swiss and German troops in the French army and after 1759 they became widespread among the French line regiments, often on the whim of the regiment's colonel. 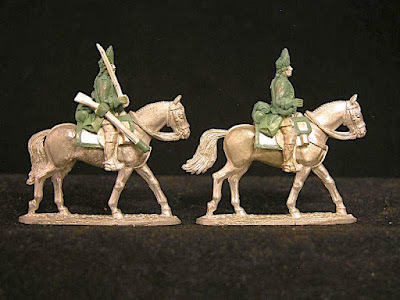 I will post pictures of the French cavalrie in bearskins and the Austrian horse grenadiers within another day or two as this post is getting rather picture heavy. The greens are being sent to Griffin Moulds this week and the normal turn-around time for making moulds and spinning new production castings takes approximately 4 weeks. Alas, probably not in time for Christmas purchases, but you will certainly be able to start off the new year with some French and Austrian heavy cavalry, etc. 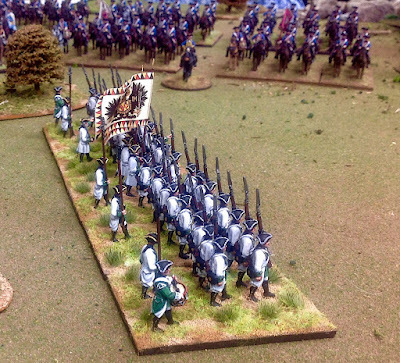 A ground level view of the Los Rios regiment - first battalion. 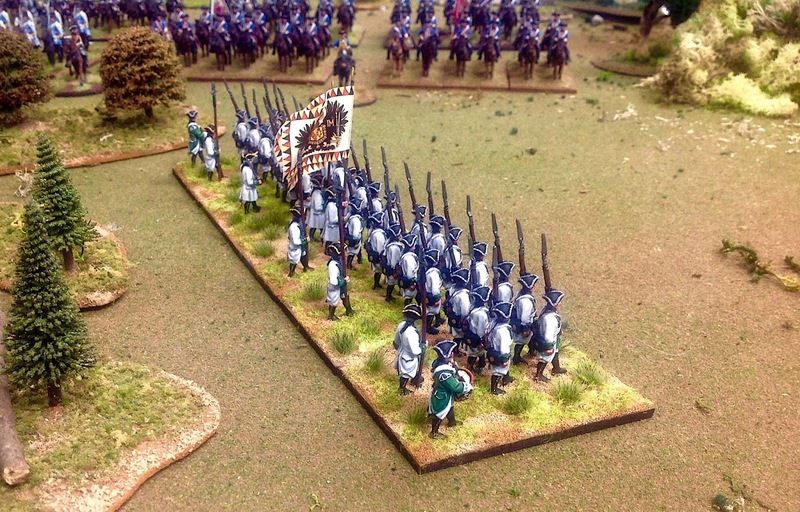 Yesterday, I finished the painting and basing of a new battalion for my SYW Austrian army. The battalion has 42 figures allocated across five bases that are 60mm frontage and 80mm depth. 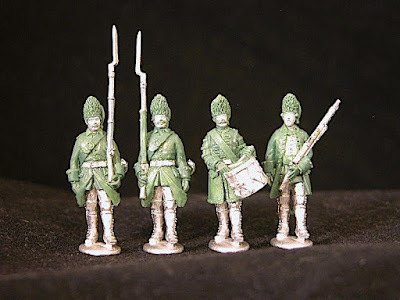 Normally I go with a depth of 40mm, but I wanted the battalion to match up with the Austrian regiment Lacy (2 battalions) in firing line, which had bases of the same dimensions. The deeper stands allow me to add in a third row of file closers. Drummers were supposed to be positioned on each flank of the battalion while a row of NCOs with pole arms keep the rank and file in line. 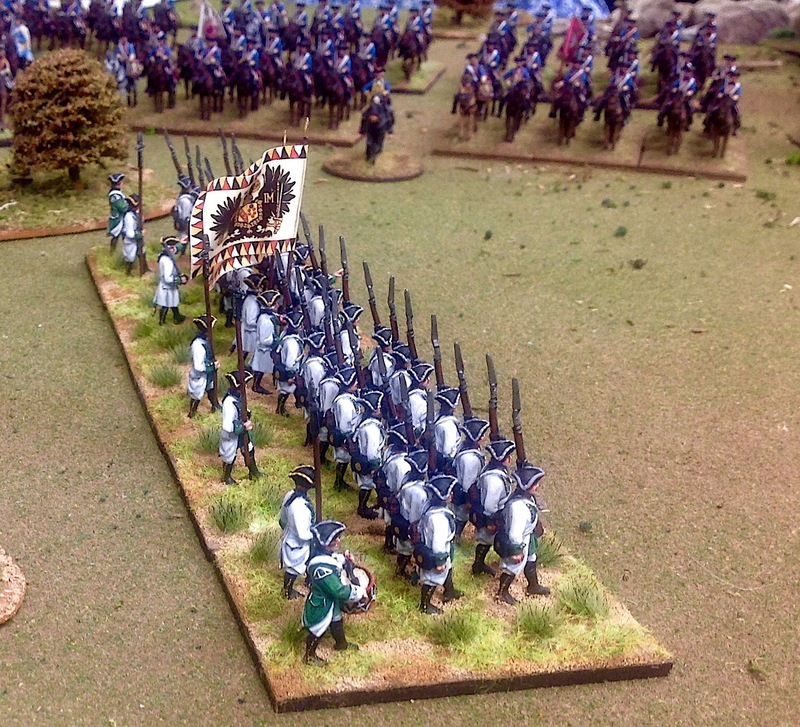 Los Rios battalion seen from the front right flank. 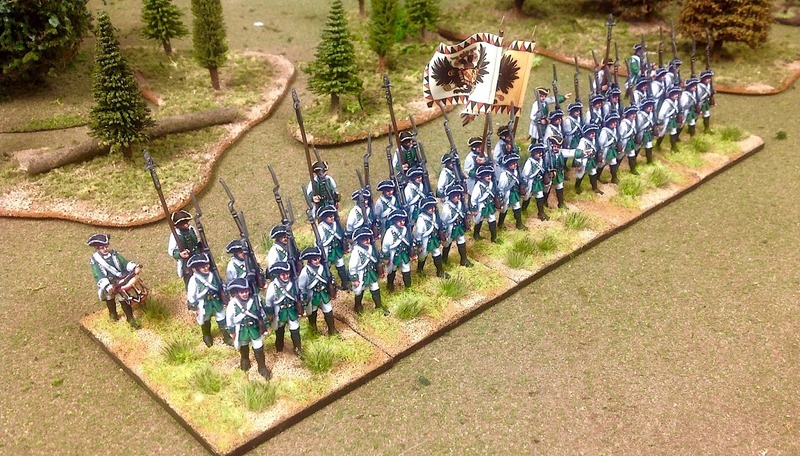 Los Rios was a regiment based in the Austrian Netherlands (Belgium and Luxembourg) and it came into Austrian service in 1725. You can read the regimental history by clicking on the link to Kronoskaf. The regiment had a uniform of green facings and until 1762, a green waistcoat, which makes it rather unique in the Austrian army of the SYW. 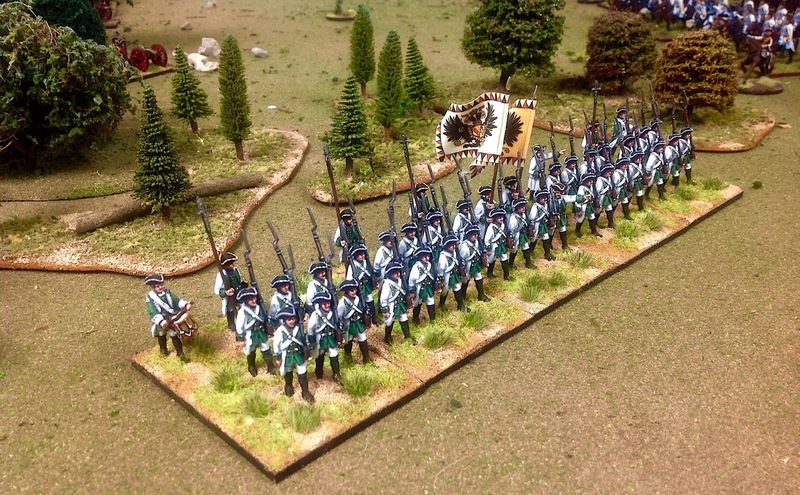 So of course I had to have this regiment in my Austrian army to give it more variety in appearance. 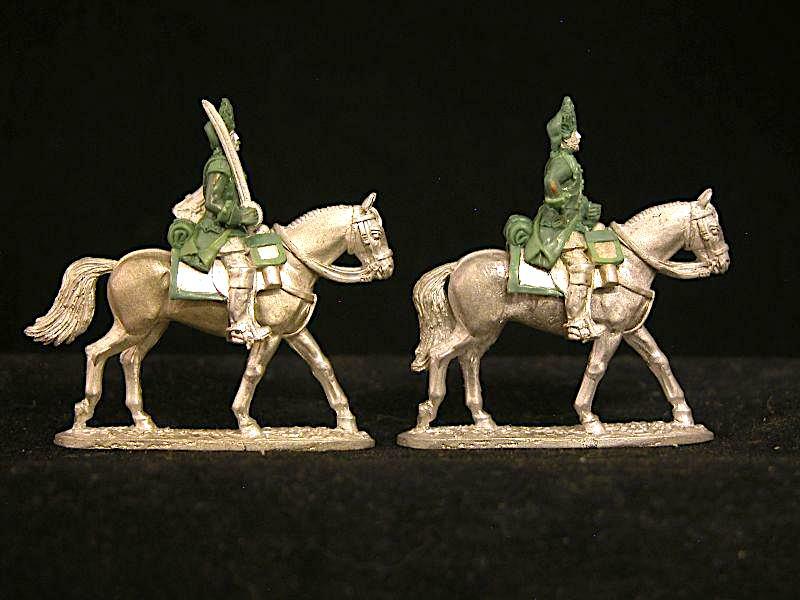 In an endless see of white cloth, the regiment really stands out from the other regiments. The battalion is in the marching pose and with the extra depth of the base I was able to add a third rank of file closers consisting of drummers, NCOs and officers. I have the option of removing one of the stands if I want to use a smaller 32 to 34 figure battalion, compared to my new Prussian battalions that have 32 figures. Here you can clearly see how the file closers create the illustion of a third rank of figures. My original intent was to have a 40-figure battalion (8 figures per stand), however, by placing one figure on each stand in a third rank, this resulted in several stands having a configuration of 4 figures in the front rank, 3 figures in the second rank, and 1 NCO figure in the third rank. That second rank with only 3 figures did not look right to my eye, so the easiest solution was to simply add another figure (the nineth figure on the stand) to the stand in order to have 4 figures in the front rank and 4 figures in the second rank. A front view of the battalion. The file closers are less noticeable from this angle. 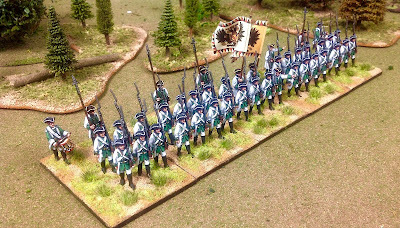 Front view of the Los Rios first battalion. You can tell that it is the first battalion of the regiment because it has the white Inhaber's colour as well as the colored orange regimental flag. Same as the picture above, only a little bit closer in view. 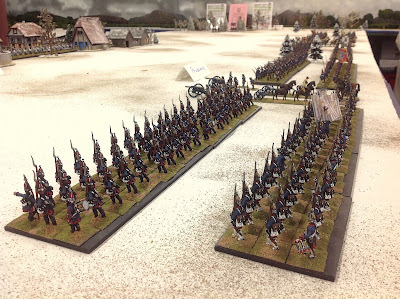 I will undoubtedly paint the second battalion of the regiment because I usually paint both regiments in my Austrian and Prussian tabletop armies. I really like the look of the battalion on the deeper base as the third rank of file closers really sets it off in an attractive manner. This morning I received pictures of the new greens sculpted by Richard Ansell. The new batch of figures will include four French heavy cavalrie wearing bearskin hats, four French foot grenadiers in bearskins, and 4 Austrian horse grenadiers wearing bearskin hats. It was a bad month to be a bear apparently. 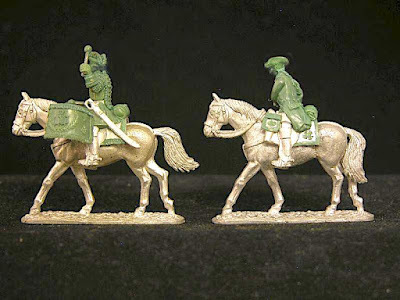 I usually post pictures of new Minden SYW and Fife & Drum AWI figures on the forum a few days before they are posted on my blog. I would encourage readers to click on the link to see the new swag. However, if you are not a forum member, you will have to sign up before you can see all of the new goodies. There are very few rules on the forum, i.e. no requirement to post anything or comment on any of the news posts. So if you want to be one of the lucky few who get an early preview of new figures, then why not sign up for a free forum membership? The new figures are rounded out with some personality figures for the French army, includeing Lt. General Chevert and Marshal de Broglie plus a French kettle drummer to use in your Minden cavalry regiments. 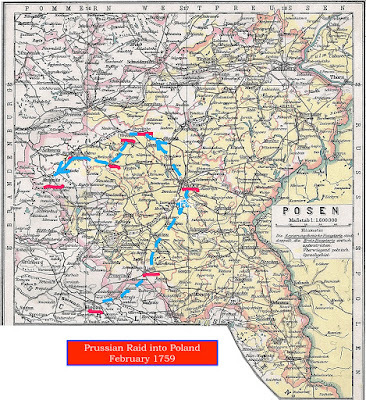 Map showing the rout of the Prussian incursion into Poland in February 1759. I have found some additional information about the raid that the Prussian general Wobersnow conducted into Poland in February 1759. A tip of the tricorn goes to reader Dave Franklin for pointing out a more detailed account of the raid on the Kronoskaf website. 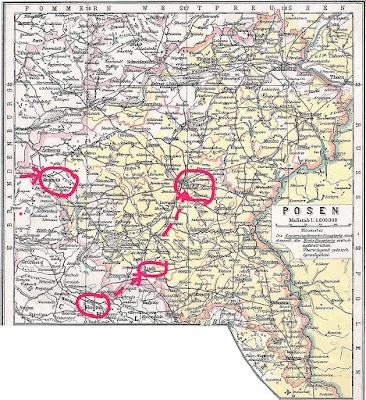 I have been able to fill in more details about the path taken by the Prussian forces on the return trip to Silesia, from Posen in Poland. See the blue dash lines to follow the route. I found this interesting little nugget of information in a book called, "History of the Late War in Germany" by Lloyd - Volume 3, which covers the years 1758 and 1759. I was particularly drawn to the year 1759 as I am doing some research on the battle of Kunersdorf, fought in 1759. The short piece describes a Prussian raid into Poland to disrupt various Russian outposts and supply depots. (the long run on sentences and the poor grammar are a product of the times, noting that the book was published in 1790). All these troops (the Russians) had been in quarters behind the Vistula river, and extended throughout the kingdom of Prussia; the light troops, even in the winter, often advanced to the frontiers of Pommerania, with a view to plunder and rise [sic] contributions, in which they generally succeeded, more or less, notwithstanding the vigilence of the Prussians cantoned in that country, who were commanded by General Schlabendorf. In the end of February, General Platen took command, and had his headquarters at Stolpe; it was resolved by the King of Prussia to send a corps into Poland, to detroy the enemy's magazines, which lay scattered over the country, before the front of the Russians, in small defenseless towns and villages, guarded only by paraties of 20 to 30 men, contrary to all rules of prudence, which require, that no depot whatever should be placed before the front, or in defenseless towns, and well defended, for an army cannot like a traveller, find inns on the road, or refresh or nourish it. To put the project into execution, Major General Wobersnow was ordered to assemble a corps, near Gross Glogiau in Silesia, which consisted of six battalions, and twenty-five squadrons, and on the 24th he marched towards Poland. 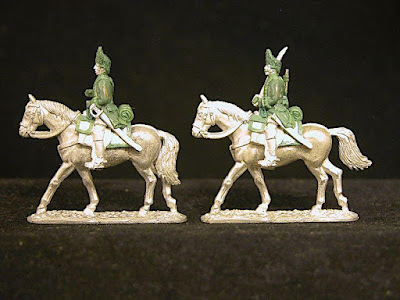 In their way the Prussians took Prince Salkowski in his palace, and carried him and his guard (about 200 men) into Silesia on the pretence that he was connected with the Russians. 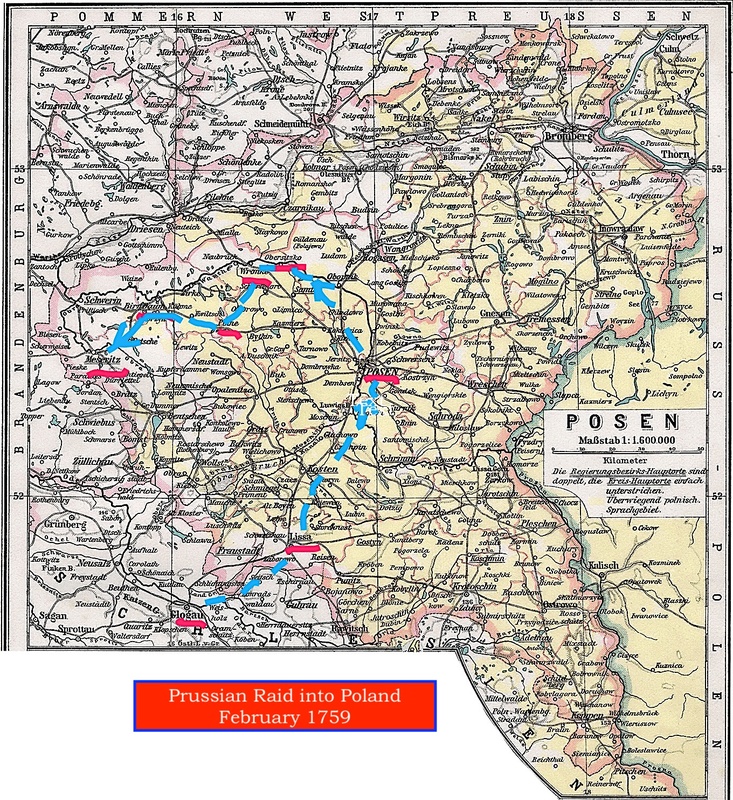 From Lissa in Poland the Prussians marched to Posen, where they found a magazine, which they destroyed; at the same time General Platen sent a detachment of cavalry under Colonel Platen, along the Wartha towards Meseritz, where they destroyed a considerable magazine; after which the Prussians who began to want provisions, on the fourth of March quitted Poland, and having accomplished in a great measure their object, returned to Silesia. 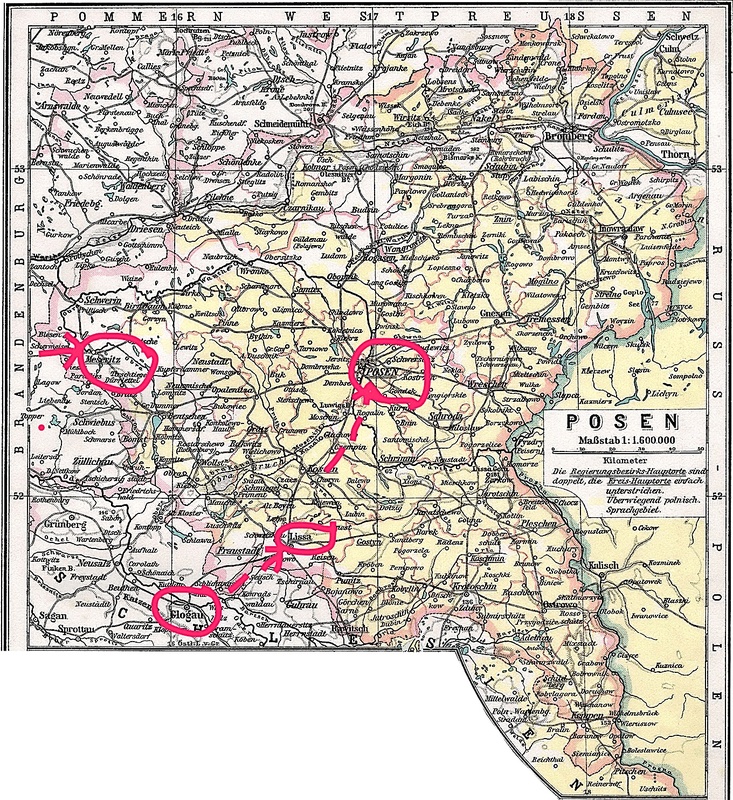 The Russian account of this transaction says, that Colonel Dalcke who had been sent, with a detachment on the road towards Posen was informed, the Prussians had entered Poland in several columns, one under the King in person, another under Count Dohna, and were advancing towards the Vistula, all which, however false, was believed, upon which Colonel Dalcke was reinforced, and ordered to follow and observe the enemy in his retreat, but nothing happened worth mentioning. This alarm obliged the Russians to take precautions, in case the enemy did really approach the Vistula, and the better to observe the enemy, a considerable corps under Kramachokow who commanded the Cossacks, was sent towards New Stettin in Pomerania, where a very sharp encounter happened, in which Captain Hohendorff, who had three hundred men infantry and (illegible) cannon, and captain Wussow with one hundred dragoons, had the advantage, having forced the Russians to retire with loss. Wossow was killed, and much regretted. The disposition made by these two captains would do honor to any general officers, one does not find many such captains. I mention this affair, in itself of no great consequences, to show there are men of genius in the lower rank of officers, whom a general should know, protect and employ.